Home and office design are converging. Ari Kepnes of Density explains why. “We’re no longer tethered to a desk through cords and cables,” said Kylie Roth, Knoll’s Senior Director of Workplace Research at the NeoCon commercial design event. Increased flexibility on where work is done has led to the rise of working from home. Among non-self-employed workers, work-at-home has grown by 140 percent since 2005. Forty-three percent of employed Americans occasionally work remotely. Thirty-seven percent of knowledge workers come into the office fewer than five days a week. The workplace is a strategic asset for attracting and retaining top talent. In a 2017 UK study of 2,800 knowledge workers, 67 percent of participants attributed the reason for leaving their last role to a workplace not being optimized for their needs. 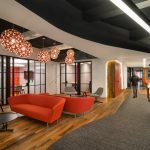 CapitalOne’s 2017 Work Environment Survey found that roughly 65 percent of US workers believe that workplace design is equally or more important than location when considering a new job. Seventy percent of highly satisfied workers are able to choose a variety of spaces at work. Effective workplaces encourage employees to use different spaces for different needs. The goal of workplace strategy is to balance a mix of focus spaces, sharing spaces, social spaces, and team spaces that meet employee needs. Like home design, this mix heavily favors communal spaces. More than 50 percent of work today is group-based, and 39 percent of time is spent on informal group activities. Companies are responding by shrinking personal space and investing in more collaborative areas. Workplaces typically allot 150 square feet per person, 33 percent less than 225 square feet in 2010. Some workplaces are shrinking to as little 60 square feet per employee by eliminating assigned desks and designated personal space. “Hoteling” and “hot desking” policies grant employees access to space on an as-needed basis. Much like an apartment studio, open offices blur boundaries between public and personal space to maximize square feet. In exchange for less space, employees no longer exclusively choose between the cubical or conference room. Employers are investing in amenities and services for activities that employees would normally to do at home or elsewhere. Sixty-four percent of CBRE clients are focusing on amenities and services, including on-site cafeterias, fitness areas, and dry-cleaning/laundry. Companies plan to provide even more amenities in the next five years including childcare, meditation areas, game rooms, and outdoor recreation areas. From an interior design perspective, workplaces are outfitted like a home. Office furniture today incorporates comforts of a home — lounge chairs and couches, warm natural lighting, stylish fabrics, and plants for decor. It’s no coincidence that modern workplace furniture looks like it was made for the home. Office furniture companies are entering the home furnishing market and vice versa. Knoll recently acquired Muuto, a Scandinavian “resimercial” brand for the workplace and home. West Elm, a company known for residential furniture, recently launched an office furniture line. Staples and Ikea sell the same furniture to businesses and individuals alike. The interior design of workplaces are clearly adopting design elements from home. This trend seems to apply to the buildings themselves. WeWork recently expanded into co-living with WeLive apartments, dorm-like facilities that offer communal daily activities. Like WeWork members, WeLive residents forego the size of personal space for perks. Facebook’s new campus will include 1,500 apartments and a grocery store. Google plans to build as much as 10,000 homes on its Mountain View property, which will include retail stores and entertainment. Multi-use buildings are on the rise as developers expand into live-work-play projects. Interesting article. I might contribute a slightly different perspective regarding the absence of efforts to develop a more inclusive and effective remote work methodology. The dialogue now is pretty much either (come to the office) or work from home/coffee shop on a periodic basis. This approach has limited inclusion and undermines many benefits of organizational design i.e. division of labor and mentorship. Given issues of income disparity, housing affordability, traffic congestion, security, preparedness, and climate impact, I’m hopeful that we might expand the conversation to examine how a more distributed office network for knowledge-based employers could better support employees in centers closer to their homes. These Enterprise Centers allow each local community to network across the metroplex, making more jobs available locally. This approach supports more potential workers including part-time working parents, students and those with disabilities. The Enterprise Center approach allows each community the ability to integrate other key community needs i.e. distance learning classrooms, remote clinics, daycare, workforce development, and emergency response. The distributed densities create a more effective congestion mitigation tool and assure the use of a secure backbone regional network. Amazing article. I watched the video few days back. Thanks. Thanks for sharing! With more and more people transitioning to work-from-home positions, it’s important that they are well-prepared for the change in environments and challenges they’ll face. Working from home isn’t suitable for everyone. I’ve published a post sharing my experiences and tips for successfully working from home titled, “The Ultimate Guide to Working from Home.” You can find it here: https://www.skutchi.com/blog/the-ultimate-guide-to-working-from-home.html. Hopefully, this will help some of your readers that are considering making the jump.